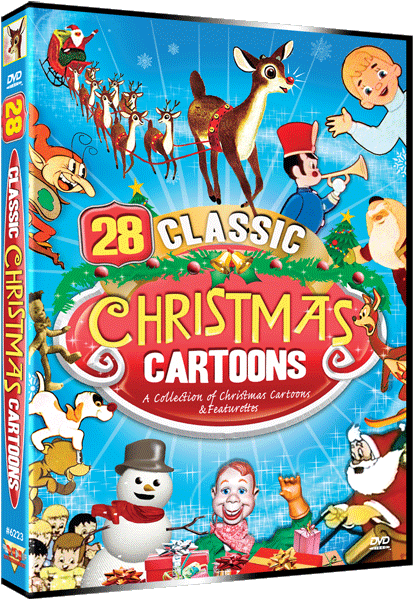 Nearly 4-hours of entertainment is packed into this special DVD — a delightful collection of 28 classic cartoons and live-action programs, all with traditional holiday themes and chock full of good Christmas cheer! A family of Australian children are riding home from school for the Christmas holidays when they meet two strangers. They tell them about their lives, including their new and valuable horse at home. The next morning when they wake they discover that the mare and her foal have been stolen. Feeling responsible for the theft, they set off to recover the horses and catch the criminals. George! – In this comedy, the quiet life of an airplane pilot (Marshall Thompson) living in Switzerland is terribly disrupted when his sister gets married for the fourth time and bequeaths him her 250-pound St. Bernard. The bachelor and the big slobbery dog do not immediately become friends. Later they bond when the St. Bernard saves the bachelor’s life during an avalanche. 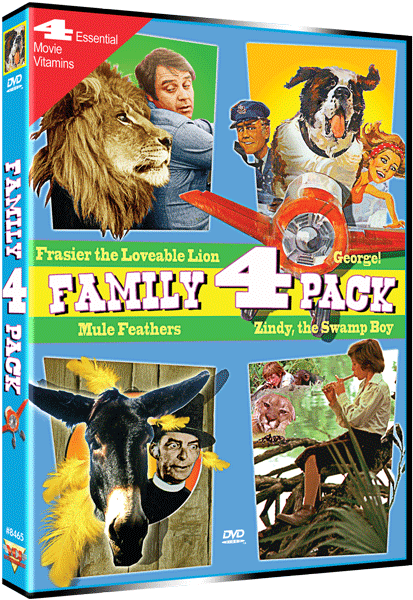 Frasier the Loveable Lion – Professor Marvin Feldman (Michael Callan) loves animals more than the beings of the human race, including his students. He lives at home with his overbearing mother who calls his prized Amazonian parrot a “fancy chicken”. Fortuitously, Marvin gets a chance to spend some time with a wildlife refuge in California. There, he is introduced to Frazier, an older lion whose youthfulness is still amazing. One day, Marvin travels alone to observe the lions when Frazier starts to talk with him…in English. Once word gets out that the king of the beasts is communicating with a human, the spotlight shines on the animal sanctuary. Does Frazier have something to tell and teach to the supposedly superior beings of this planet? Mule Feathers – Narrated by Don Knotts, the movie is about a roving preacher traveling the countryside in the company of a hilarious talking mule (voice by Don Knotts) and stumbles upon a search for hidden gold treasure that turns into a close encounter with an angry, grizzled Rory Calhoun. Zindy, The Swamp Boy – A grandfather and his young grandson named Zindy get lost in the jungle. 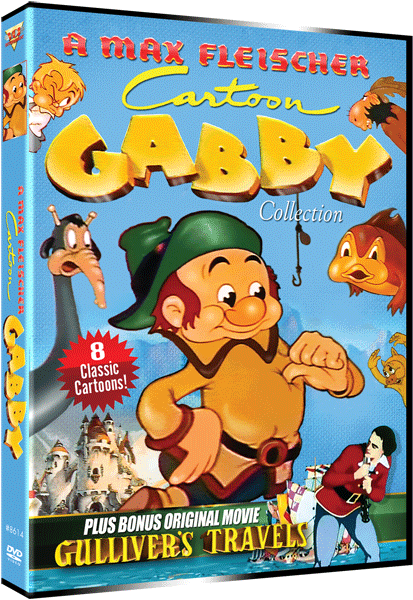 During their attempt to find a way home, a terrible storm hits and Zindy’s grandfather is swallowed by the swamp. Zindy is left to raise himself in the jungle amongst the savage beasts. Zindy luckily finds the help of a new found friend, and together embark on an adventure that they will never forget. Where The Red Fern Grows II is a continuation of the classic novel, a story as magical as the original. The haunting richness of the Louisiana woods, the innocent joy we find in Old Dan and Little Ann, and the loving wisdom of Grandpa Coleman combine to touch the hearts of young and old alike. 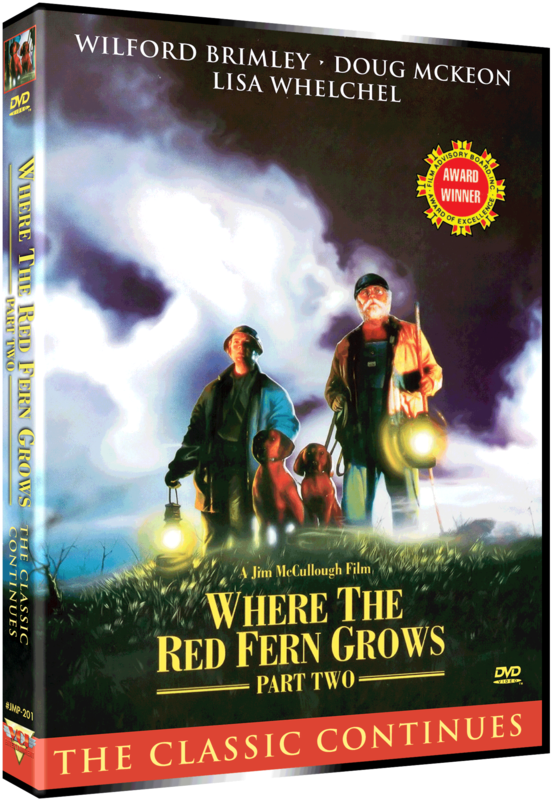 In Red Fern II, Billy Coleman (Doug McKeon) returns from WWII to his grandfather’s (Wilford Brimley) home in Louisiana and tries to readjust to civilian life. But the killing he witnessed in the war, along with the fact that he has lost a leg to an enemy bullet, has embittered him. Grandpa had anticipated Billy’s state of mind and has a therapeutic gift waiting for him: a pair of Redbone hound puppies – just like the ones he had as a boy. In addition to the puppies, Billy befriends a young neighborhood boy, Wilson (Adam Faraizl), who reminds him of himself. Wilson and the hounds become closest friends and together they help Billy to rediscover the gift of giving – ultimately rediscovering himself.